If you saw the results from the recent British Pie Awards 2015 you will have noticed the current darlings of the pie world are the Great North Pie Company. 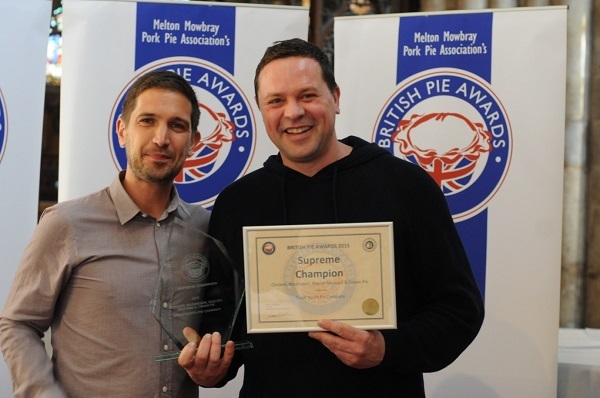 Supreme Champions for their Chicken, Mushroom and Mustard pie, as well as scooping the Small Producer Award. But what are their pies actually like? Pierateer RAS has previously enjoyed their meat pie, although it didn’t challenge at the top of our pie rankings. 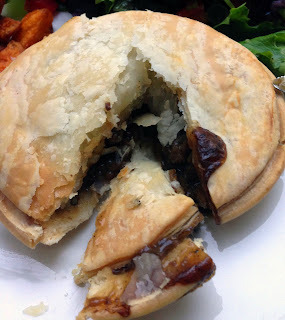 The Great North Pie Company have an ever changing seasonal selection of pies, so what is the current crop like? A trip to Selfridges Food Hall provided a surprising discovery. We have previously enjoyed a number of Tom’s Pies from Selfridges but it seems like Tom’s range has been replaces with a number of pies from the Great North Pie Co. which a sign proclaims are ‘exclusive’ to Selfridges. I was less than happy about the price, at £4.99 each, these are more expensive than the Tom's pies. But, this seemed like a bit too much of a good opportunity to miss, so after a trip to the bank to take out a second mortgage I bought 3 pies. The hilariously named Goosnargh Chicken, Mushroom & Cream, a Steak & Stout and a Ham and Black Pudding. Unless I am very much mistaken the Goosnargh is none other than the British Pie Awards winner itself (or at least very similar) that I have just happened to stumble across! What are the chances?! (Actually they are probably quite high as I am constantly 'window shopping' for promising pies, that's the life of a Pierateer.) Apparently Goosnargh is just the name of the Northern village where the chicken come from and is recommended by top chefs, so it shows that I am not sophisticated because I thought it was a funny name! But did they live up to the expectations? The Great Northern Pie Company claim to make ‘artisan’ pies and I can certainly see what they mean. 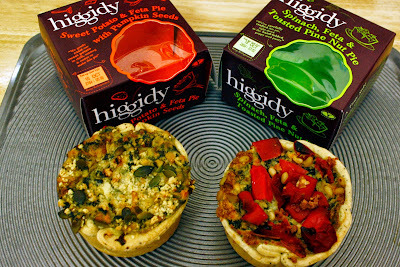 These pies have unique flavours and are quite unlike anything I have come across before. I am really glad they are trying something different and the flavours were very interesting. These pies were well presented without being over the top. Despite having shoved them on the front of a Boris Bike on a bumpy journey they held together well. I do like a sturdy pie as it is really what I look for in the ultimate pie. Even when cooked, these are pies that you would pick up and eat with your hands (although that might not quite be the market they are going for!). In every case, the pie was very filling and satisfying, they were above average size for individual pies. The pastry was a real winner here, with a lovely buttery flavour. It was crumbly and crunchy on the outside and soft on the inside. 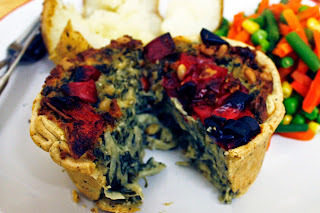 All the fillings were full of flavour and these were anything but your run of the mill bland pies! Whilst I liked them all, I am sorry to say that none of the flavours worked really well for me personally. I probably just have an unsophisticated pallet, but if they sound like your kind of thing then effectively consider that they have a higher score. If you are a pie fan I would certainly recommend trying one of these pies as you won’t get the same experience anywhere else. See below for the score breakdown. Condition - 6.0 out of 7 - Adorned with a sprinkling of crumb and seeds to the lid, I found all these pies looked really appealing. Cheapness - 3.5 out of 7 - £4.99, you cannot be serious!? For any pie this just seems like too much, it is not something I would fork out very often for. Unless you are trying to impress someone or you really like the sound of the flavours, for most people this would be a very occasional purchase, if they can afford it at all. But then, who shops in Selfridges Food Hall?! That said the pies were quite big and full of content so at least you feel you do get something for your money. If you can get this pie cheaper elsewhere then effectively consider the score higher, but like I said, Selfridges did have a sign saying 'exclusive'. Capacity - 6.5 out of 7 - Fabulously full, these pies were packed with meaty content. They are also quite big for individual pies. Chewiness - 6.0 out of 7 - Fibrous chicken pieces provided something to get the teeth into. The mushroom provided a variety in texture to the chicken. A nice texture to the crumbly pastry. Content - 5.5 out of 7 - The first thing that struck me was how yellow the sauce was which doesn't quite come across in the photos. This must have been mustard or turmeric. There was plenty of flavoursome chicken and also quite a lot of mushroom. The sauce was satisfyingly thick and creamy. It had flavours which I couldn't quite place. It didn't have a 'hot' spicy taste as I might have expected from mustard. The main flavour I noticed was an aniseed or fennel type flavour. This seemed quite an odd flavour and, although it was nice to have something different, I would have preferred less of this flavour as I found it a bit overpowering. Consistency - 6.0 out of 7 - The sauce was extremely thick which meant this pie could be eaten with the hands if needed. The pastry and filling came together in harmony to produce a pie which worked really well. Condition - 5.9 out of 7 - Slightly less adorned than the chicken pie. Cheapness - 3.5 out of 7 - This pie was again full of content to make up for the high price. Capacity - 6.5 out of 7 - Again, it was well filled. Chewiness - 4.5 out of 7 - Some nice pieces of steak to chew on but in this case I felt some of them were slightly too chewy for a premium pie like this. 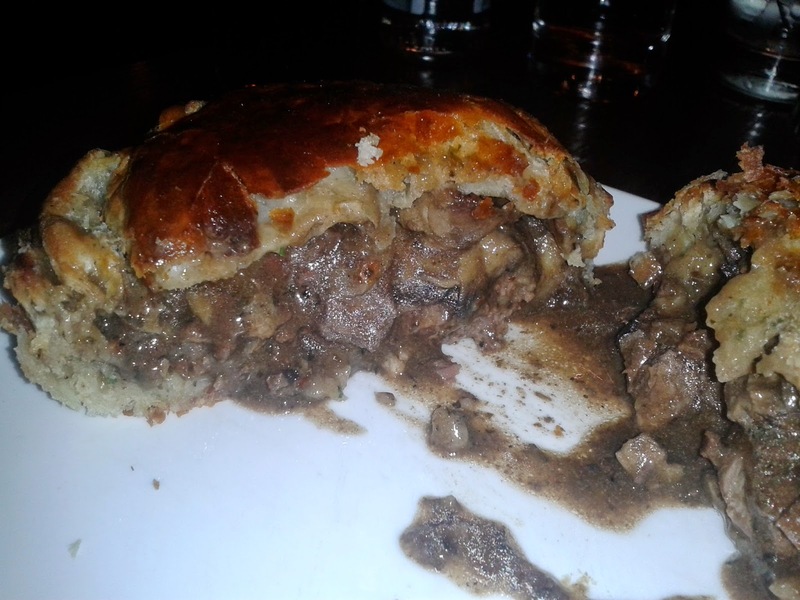 Content - 4.0 out of 7 - A lot of steak in this pie which had a nice flavour. It was again in a very thick, gloopy sauce and again it had flavours unlike any other pie I have had. It had a sour, roasted taste from the stout but there was also a definite sweetness to the sauce and it was quite tangy. It made me think it might have marmite in it, or perhaps bovril as I know they have used this for some of their other pies. I thought it also looked a bit like marmite. Consistency - 4.0 out of 7 - There was a lot going on with the flavours of this pie and for me it didn't quite work as a package. That said, it wasn't unpleasant and a lot of the individual elements were good, they just didn't come together well (for me). Chewiness - 5.9 out of 7 - The soft strings of meat were chewy but only enough that there was something to get your teeth into. Content - 5.6 out of 7 - Packed with meat, there wasn't really much liquid sauce to this particular pie, however, it was still wonderfully moist. The black pudding worked really well in the pie making it meaty and flavoursome. There was a small amount of veg too. One mouthful might be different to the next. However, there was again a strong aniseed or fennel flavour which I felt was too much for me. Consistency - 5.5 out of 7 - Meaty and interesting, this is a pie I would have again (as long as I didn't need to pay for it). For some reason I had a massive pie craving at the end of last week. I was in Leatherhead, which you may or may not know is a fairly diddy town. I went into Sainsbury’s, but their vegetarian pie selection was fairly limited. They had the Linda McCartney Country pie, but given SJL’s review of it, I wasn’t that tempted. 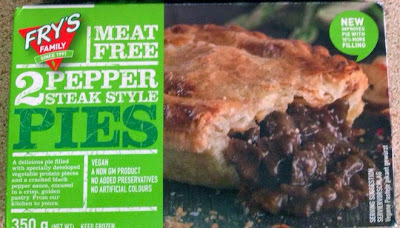 I picked up some Pukka pies for GHH, then set off to Holland and Barrett, who have a fairly nice selection of fridge and frozen foods for specialist diets. I had been in there at the start of my shop for some flax seed, and had glanced in their freezer. Though I eyed up their pies due to the slightly higher price point, I thought I would look in Sainsbury’s first. Then I couldn’t choose between Fry’s Pepper Steak Style (£3.85) and Clive’s Three Bean Chilli (£4.99). So I got both. At home, once dinner time rolled around, I opted for the Fry’s pie. I had previously had Fry’s sausages and burgers and I have to say that I wasn’t too impressed. The benefit (or problem) of Fry’s products is that they are vegan which will result in a pasty that is not quite the same as most pies. 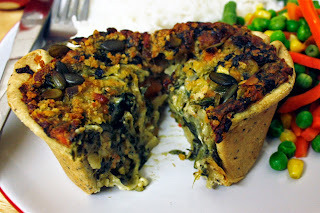 This is the first EVER vegan pie review on the Pierate Ship, which automatically makes it our current number 1 Vegan Pie! The first thing that told me this pie was only going to be so-so was that when I read the instructions; it needed to be defrosted first. Given the metal case, that ruled out the microwave (or risk it collapsing). I had it sitting on the side for around an hour before I put it in the over; I couldn’t wait any longer. I didn’t time the cook time for the pie, given that it was still very frozen, but I took it out of the oven once was hot through and the gravy was leaking out of the top. On hindsight, it probably should have been cooked for longer; it was still fairly pale on top and the bottom of the pastry was underdone and chewy. Also, look at the box- just where is that lovely crimped edge? 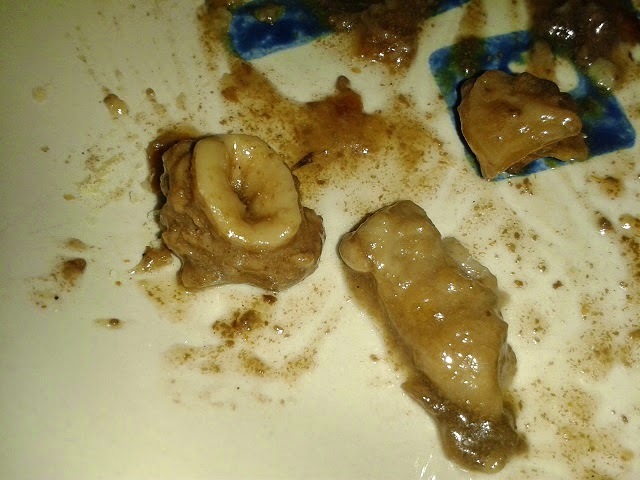 As for the ‘meat’ chunks, they were nice. They were tender and moist and the thick gravy was flavourful. However as someone who shares a lot of meals with GHH, who is addicted to pepper, even for me it was too peppery. Also, the pie itself was fairly flat which meant the quantity of filling felt rather lacking. Maybe I should have defrosted it first, but I don’t really think that would have helped the content. At least I can try again given there were too pies in the packet. Overall, I would probably go for the Quorn steak style one if I could choose. Though as I said, the Fry’s pie is vegan whereas the Quorn one is not. I do disagree with SJL, generally I do like fake meats. continue reading "It's Pieday FRYday... on a Friday!" 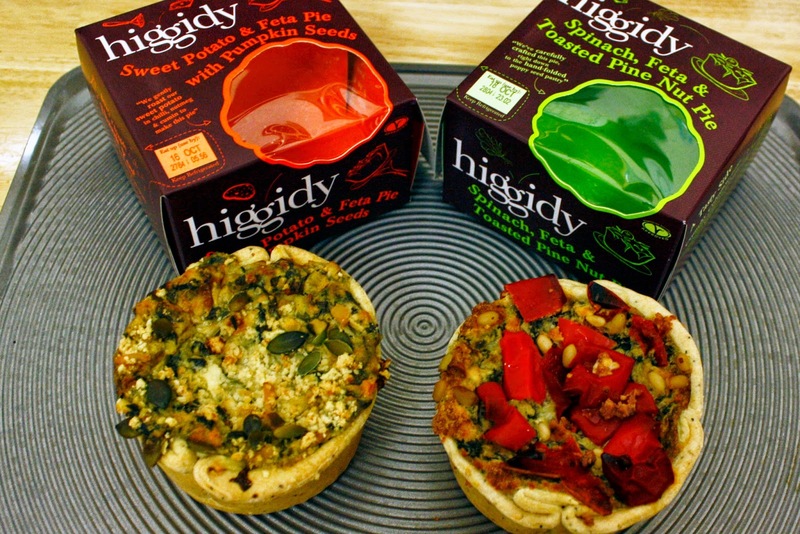 continue reading "Higgidy Pie Party, for two." Following the popularity of last week's Pieday Friday Wembley special we've decided to go all out with a live blogging of our trip to Wembley to rate the Wembley pie! For all you pie fans heading to Wembley Stadium do note that there is more than one type of pie for sale, depending on the part of the Stadium you go to. In the Club Wembley (Level 2) area the pies on offer are Tom's Pies, however the normal levels (1 and 5) sell Edward Moon Proper Pies made by Oliver James Foods. Our review is from Level 1, hence is for the Edward Moon Proper Pies. We have reviewed Tom's Pies elsewhere, these are more of a premium pie, so perhaps chose where to sit based on the type of pie they serve! With most eyes on the Wembley pitch for a dramatic 120+ minutes of drama in the League Two play-off final, we have to admit we were almost as excited to be rating the Wembley pies! We had heard they were sold by Tom's Pies but were surprised to see they were quite a different size and design to Tom's pies we had rated before. This, we later found out, was because they were not the Tom's pies we had heard about, which are only available on Level 2 of the stadium! 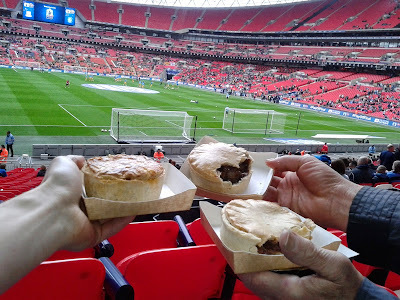 The pies on Level 1 are in fact made by Oliver James foods and Pierateer Rob went for a Beef and Spitfire Ale pie, which at £5 was quite pricey for a slightly small pie but was a bit cheaper than I had feared from some of the reports of Wembley food price inflation! However with average football prices up and down the land being £3.00 it was a significant mark up. First impressions weren't great though, to be honest. The pie was very pale in colour - almost to the point of wondering if it was cooked properly. But it was. And the pastry, while pale, didn't taste too bad despite not being crisp at all. I'd certainly suggest cooking it a bit more. However it was piping hot through. Speaking of the hot filling, it certainly stung the fingers with its heat when the content unfortunately started leaking out of the other side of the pie from the side I was eating. The condition therefore could of been better and I was very grateful of the cardboard tray the pie was served in, otherwise I would have been covered in hot gravy! While there wasn't quite enough meat for my liking, the beef I did have was nice and tender. The gravy filling was bulked out a bit with onion but on the whole was reasonably decent in capacity. However the smaller size of the pie meant the filling:pastry ratio was not ideal. In my mind, I would have this pie again at that price for a football game (which is more than I can say for some football pies I've rated!) but would never expect to pay that much in a shop for a smaller pie like that. Hopefully it would be a bit more crisp and golden too if I cooked it! This pie was buttered by name and also buttered by nature, with a very strong buttery taste to the filling in addition to the buttery taste of the pastry. It wasn't at all hot in terms of chili but it was well seasoned with other spices to make the filling thoroughly enjoyable. However, what let this pie down as a doughy pastry which didn't seem quite cooked. I ended up with epic heartburn through the match. See below for the score breakdown. 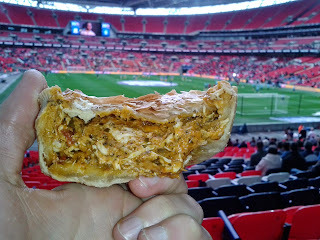 Condition - 3.8 out of 7 - The pies on sale at Wembley are fairly boring to look at and look a bit mass produced. They lack the distinctive look of the Tom's pies available in the club Wembley seats. Some of the flaky pastry lid was starting to flake off. Colour - 4.5 out of 7 - The lid had a nice golden brown but the shortcrust sides were too pale. 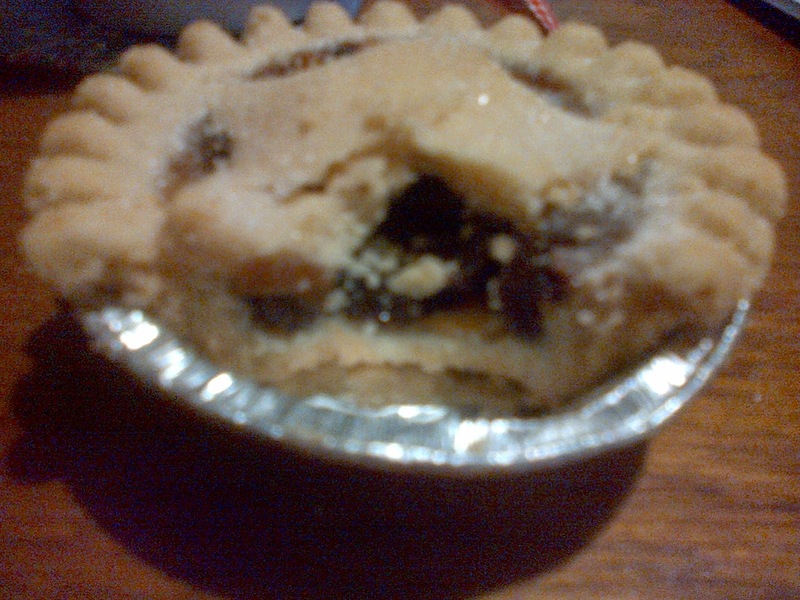 Cheapness - 3.0 out of 7 - This pie was quite small so £5 was pretty bad value, even for a football pie. I don't think there is any excuse for a Wembley pie costing more than any other football pie. Capacity - 4.8 out of 7 - Despite being small this pie was well filled with a thick content and was actually quite satisfying. Chewiness - 5.5 out of 7 - The shredded chicken in the filling was not at all chewy. There was a good texture to the pie but perhaps some slightly bigger chunks of chicken would have been good. Content - 5.7 out of 7 - One of the best Chicken Baltis I have found inside a pie. The filling was really well seasoned and had a nice tomato taste. I really like butter so the buttery taste went down well with me, but I can imagine some might find it a little too sickly. I would have liked a bit of chili with this pie, in addition to the other spices. Consistency - 5.0 out of 7 - They got the thickness of the sauce about right here, this was one you could just about pick up and eat with your hands, although the pastry did start to crumble. Undercooked pastry on the sides and base let the pie down a little. Overall a decent score for a football pie (which can sometimes be a rip off) so it puts Wembley Stadium in the top half of our football pie league. I was glad that my Dad and Grandad got into the pie reviewing spirit, both having the Beef and Ale pie. However, their choice only made me more pleased with mine as both considered the pie pretty average. My Grandad wasn't impressed by the lack of meat content in his pie although Dad said there were a couple of chunks in his. Despite the result there was plenty of excitement and a good atmosphere. My love of the Chairboys has only increased after the amount of passion the team have displayed this season. 20.30 - The tension is almost unbearable but the penalties are complete, with a 7-6 win on pens for Southend United. Southend edge it again, after their pie beat Wycombe's earlier in the season! 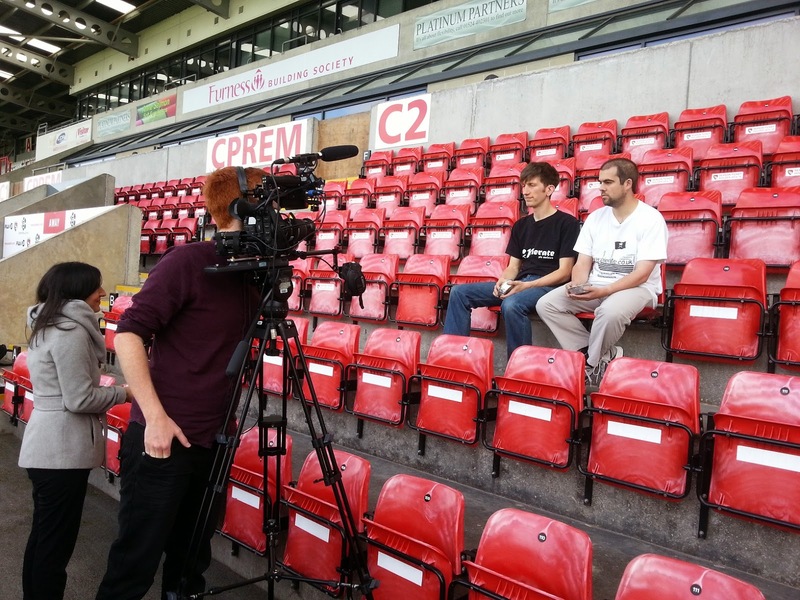 Roll on more football pie reviews next season!!! 20.10 - After a dramatic period of extra time, Wycombe taking the lead followed by a Southend equaliser with almost the last kick of the game, it's gone to pens! 19.30 - It's going to extra time after a 0-0 draw, but sadly the pie kiosk has closed! No more Wembley pies. Sad times! 18.25 - Tried to get a half time chicken balti pie for my dad but there were only vege pies left at half time. Poor pie provision there. Glad I got my pie pre-match! 17.00 - How did it rate then? Well unfortunately it was quite pale and fell apart upon biting into the pie. It had some nice chunks of meat and a good gravy to complement it but certainly have had better beef and ale pies. 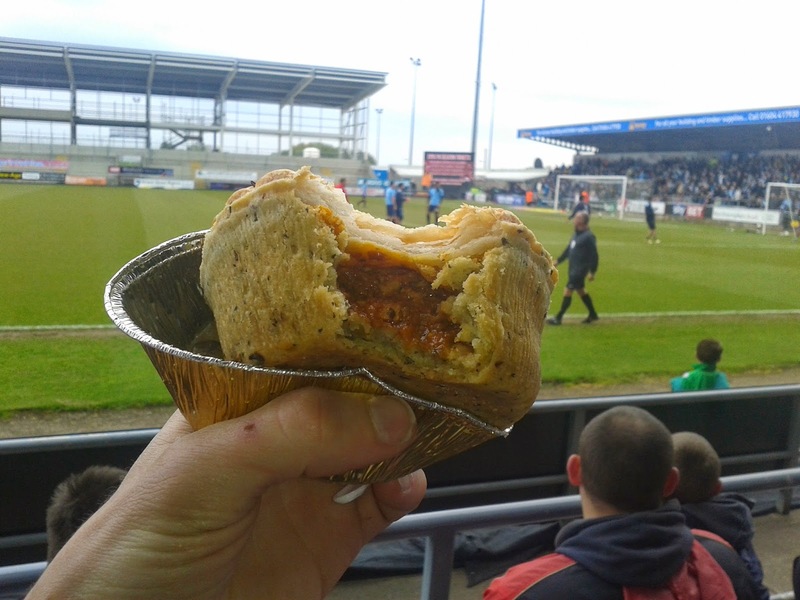 Considering it was £5 for quite a small pie, I'd buy it again but only at a football ground! 16.45 - Beef and Spitfire Ale pie picked up for £5.00 - which isn't as expensive as I feared with some of the horror stories about food pricing at Wembley! Thst said it wasn't a big pie so £5 is still more than I'd want to pay for a pie that size. 16.30 - One hour until kick off! We're in the stadium and it's time to join the pie queue!!! 14.55 - Here we go then! After a cheeky bacon bap to keep us going until pie o'clock, we're on the train to Wembley Stadium! 12.45 - Almost at Wycombe now and the excitement is building! What will the pies be like on offer at Wembley? How will they rate? 12.15 - Well on our way to Wycombe now, where we are just over 5 hours away from kick off and even less time away from our pre-match pie! 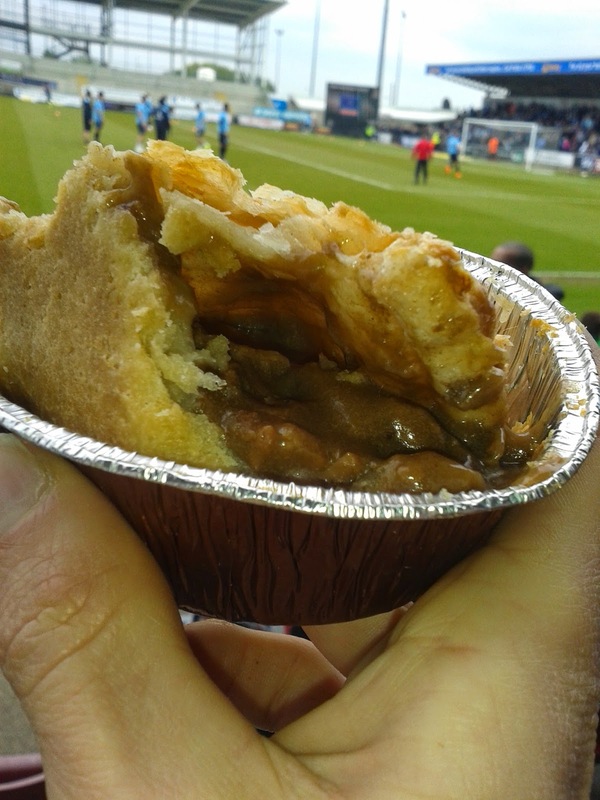 11.45 - Pierateer Sam has been doing some pre-match pie research and thinks there may be a few different pies on offer. We will see! 11.15 - Sam and Rob have got on the train from Birmingham to Wycombe, ready for a pre-Wembley lunch with fellow Blues fans! 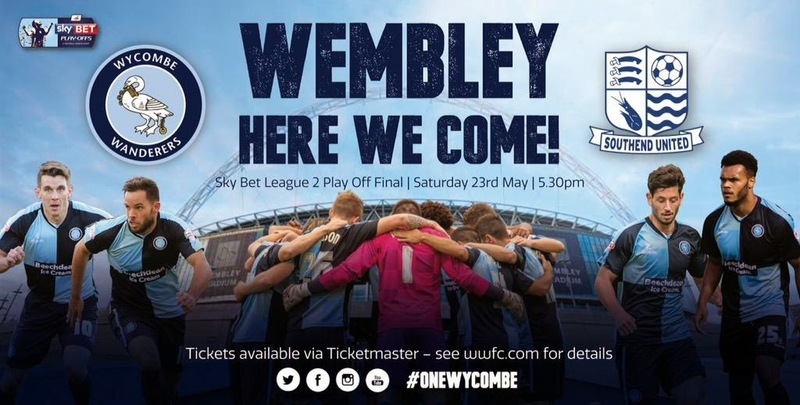 With tickets purchased and trains booked, Pierateer Rob and Pierateer Sam are heading to Wembley, with a pre-match pie for this 5:30pm kick off very much on the agenda! Will the pie hit the back of the net? 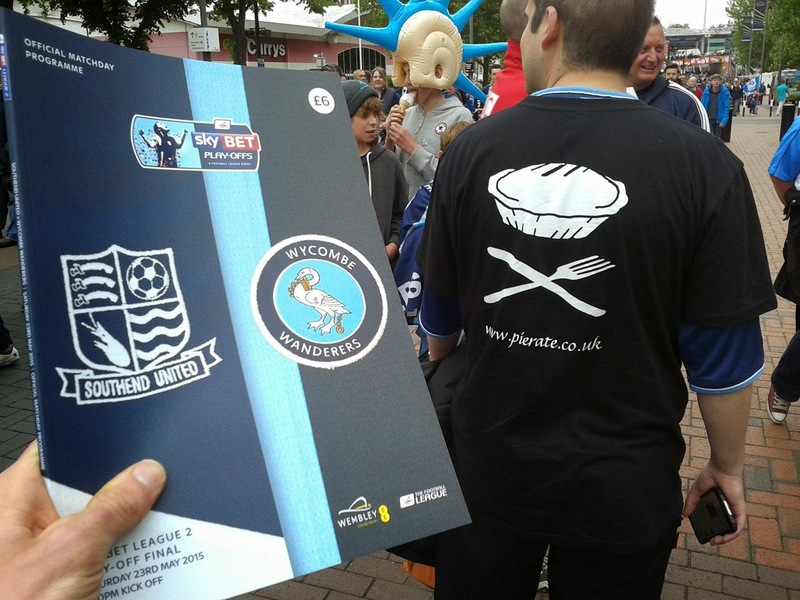 Will it live up to the hype as the pie of choice at the home of football? Will it be well priced or an absolute rip-off, as we have heard it might be? You'll find out RIGHT HERE! 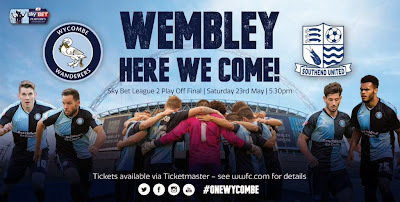 continue reading "Wembley Pie - Live Blogging"
continue reading "Pieday Friday - Wembley Pie Update - 22nd May 2015"
"Dare I suggest that a contributory factor to this decline is the lazy approach of certain pubs to the disgusting way they serve the ever popular (or it used to be) steak and ale pie." He goes on to state that often the pastry lid "has only met the meat seconds before serving" - though in some cases we have found that the pastry "lid" is in fact a completely separate piece of pastry to the stew and has NEVER met the meat, but simply been plonked on top of a ceramic dish without always covering the content of the bowl satisfactorily! Ken concludes by saying that "it might be helpful if a name could be found for this combination of meat and pastry, but pie it certainly is not." I think Ken could be trying to get a job on the Pierate Ship with such a thought through and well argued dismissal of the top crust stew with a pastry lid that, sadly, so many pubs up and down the land provide. What often makes this worse in our minds is that so many pub menus do not distinguish whether it is a proper pie - defined by us as "filling fully encased in pastry with clearly defined base, sides and lid" - or just a stew with a pastry lid. At times even the waiter or waitress do not seem to understand the importance of this distinction, claiming a stew with a lid is a "proper pie" when quizzed by us and our fellow pie eaters. Surely times have to change? I think my response to Ken's question of a name is to say it as it is. To call a spade a spade. To mention on the menu that a stew with a pastry lid is "a stew with a pastry lid"! Why re-invent the wheel? Why trick fans of the fully encased pie into purchasing a non-fully encased in pastry stew with pastry lid? Of course Ken and the Pierateers are not the only ones to be outraged by this phenomenon, as attested to by Colin V Young's response to Ken's letter and an e-petition calling for criminal charges against establishments who call on these stews "pies", which was launched over a year ago and has been reported on by many national newspapers. 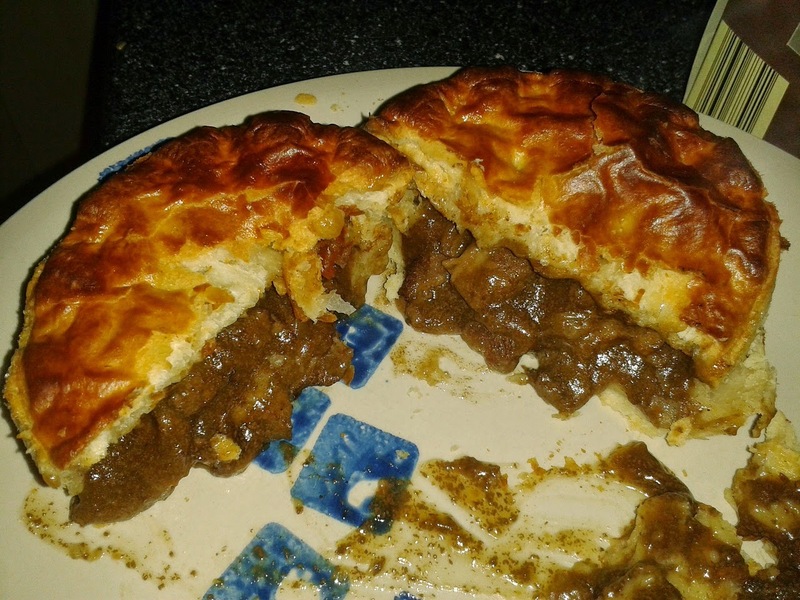 Condition and Capacity are severely compromised in a "stew with pastry lid"
Our view on the Pierate Ship is clear - that for a proper pie it has to be filling fully encased in pastry with clearly defined base, sides and lid. 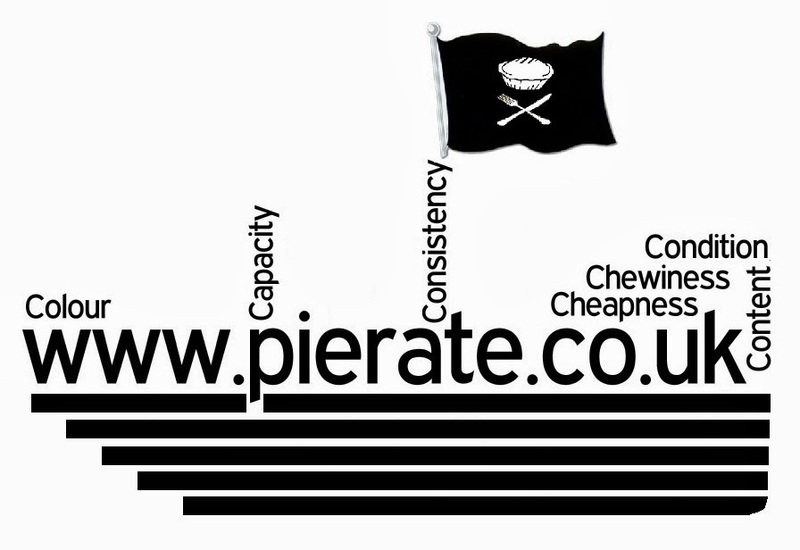 That's the only way you can challenge for top marks on board the Pierate Ship. Anything else is not a proper pie, and will be heavily criticised while giving it a rating on the 7 Cs of pie rating. 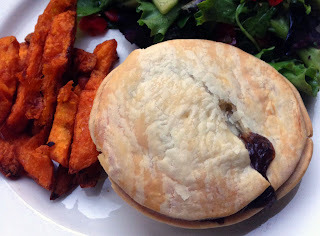 You'll be pleased to know we clearly label all "stews with a pastry lid" as such in our pub pie reviews on the web's leading pie review website. Let's hope that - for the sake of pub pie provision nationwide - pubs start doing likewise! 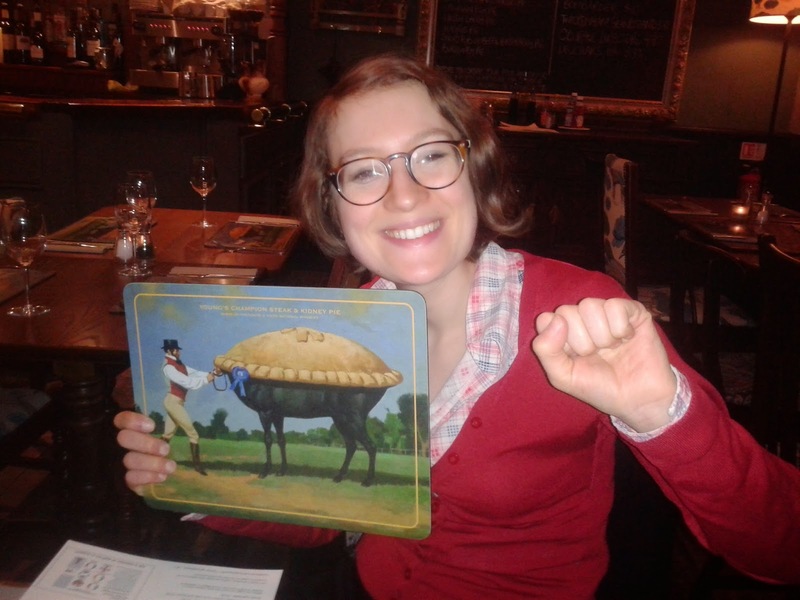 continue reading "Is it Times for a change in pub pie provision?" 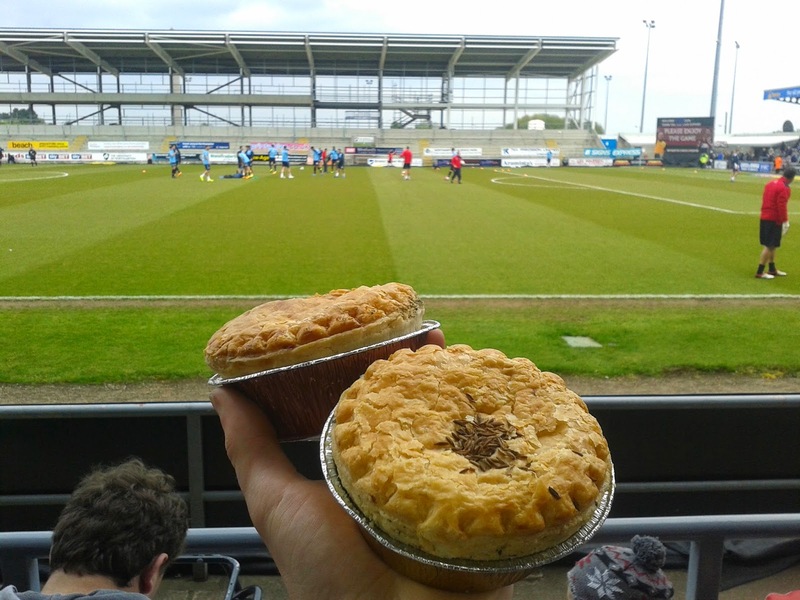 continue reading "Pieday Friday - Gluten Free and Wembley Special - 15th May 2015"
We were asked recently on twitter if there were any pies under £1 that we would recommend on the Pierate Ship and while there are some boxes of fruit pies that sprung to mind, I struggled to think of any £1 meat pies I’d had that were worth a recommendation, bar the odd Scotch Pie we bought on visits to Scotland. However that doesn’t mean to say it was impossible! 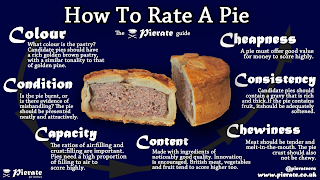 After all, we’re looking to find the perfect pie, and if a meat pie tasted great and cost just £1 then it should be very high up in our Pierate Pie Rankings (which now boast over 500 reviews). 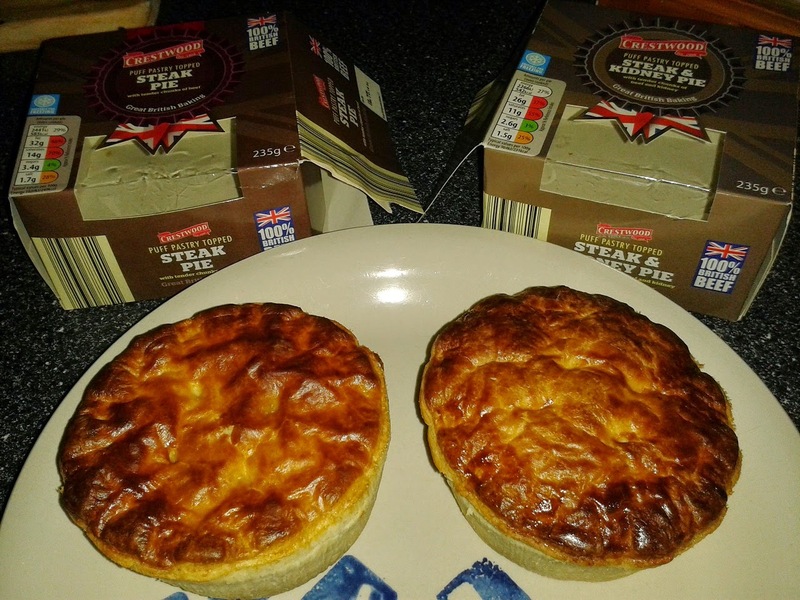 The meat pies I had from Aldi on Day One of British Pie Week were just 99p… so could these be the solution to our cheap but tasty meat pie queries? In a word… No! Unfortunately while there were a few positives to these pies from Crestwood, overall I did not enjoy eating them and would not consider buying them ever again. They were certainly 99p for a reason! The pastry, while reasonable looking on top and edible, didn’t take long to become a chore to eat. The side pastry was almost anaemic looking and not tasty. I was unsure how the side pastry could be so pale in comparison to the darker puff pastry lid. However it was the meat content that most let down these pies, with both being quite filled but having very chewy meat and large pieces of gristle. Unfortunately there was only so much of these pies I could withstand, which is not good news for their pie rating! While I know they were value pies, I struggled to find many positives to these pies, even at just 99p. Perhaps the one positive was that they were just about edible, with a nice enough gravy. Just need to improve on the pastry and meat content! 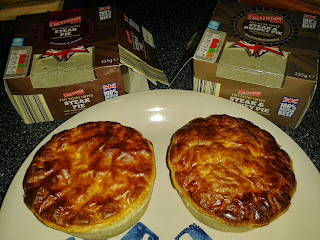 continue reading "Can you find a bargain steak pie in Aldi?" continue reading "The Wright Stuff"
continue reading "Corn on the Cobblers"
There are some places with great reputations for pies but for whatever reason it takes us a long time to get there to review them. The Windmill is one such place. It is in Mayfair, London and with all the other London pies we have reviewed, why is it not one of them?! 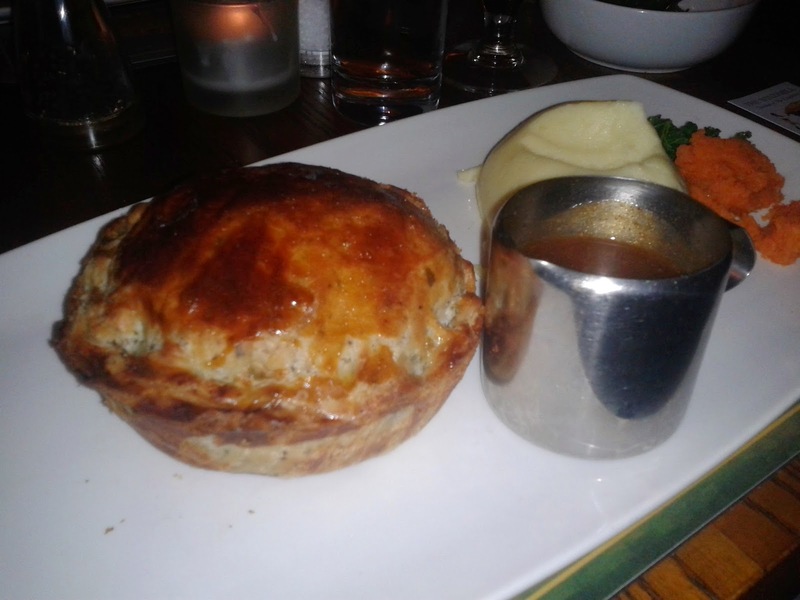 However, it has eluded us for some time, in part because their restaurant is closed for much of the weekend, so I was excited to finally pay them a visit on Day Four of British Pie Week 2015. What a time to visit. The Windmill seemed quite busy but when it is a pub with a specific 'Pie Room' of course it would be busy in British Pie Week! 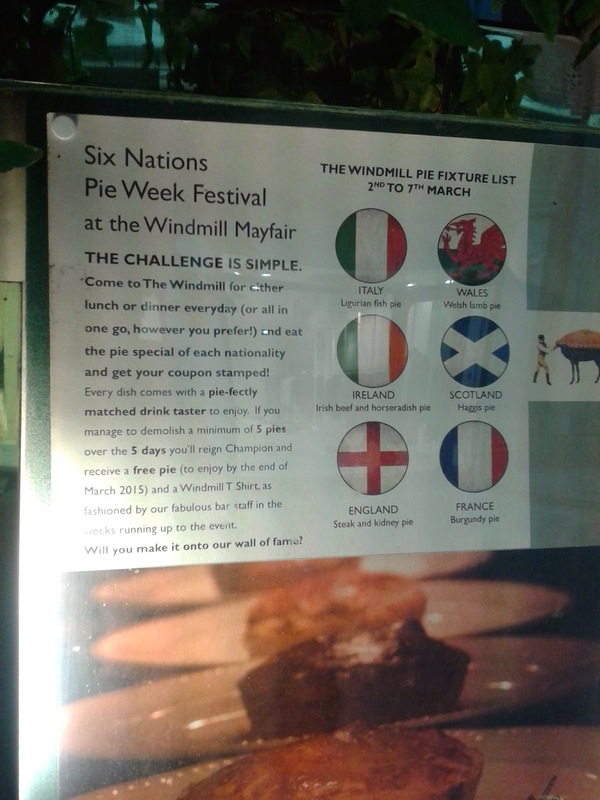 The Windmill had really got into the spirit of British Pie Week with a competition. If you could eat 5 different pies in the week you would get a 6th pie free, along with a t-shirt! I have eaten a lot of pies during British Pie Week in the past, but even I was surprised at this high requirement. But apparently there are some people who manage it! The Windmill is one of those places that will get any pie fan excited. The Lower Pie Room (yes, there are actually two pie rooms, eat your heart out Newman Arms!) where I was eating was a bit of shrine to pies and they seem to be particularly proud of their Steak & Kidney pie. There were pictures and placemats all proclaiming it as a 'Champion Steak & Kidney Pie' and 'Three times national winner'. I was unsure what award it had actually won, but they certainty seemed confident in the Steak & Kidney's quality. There was a whole menu devoted to pies and some interesting flavours. 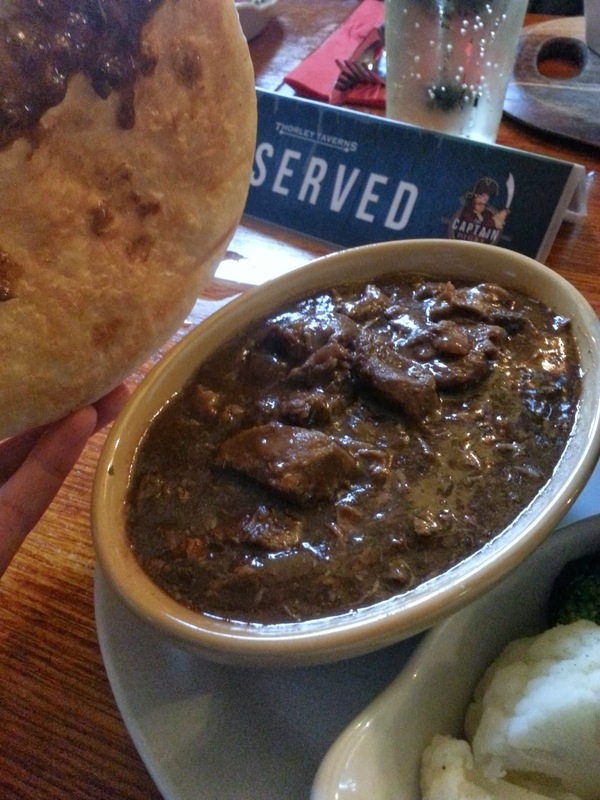 Haggis was tempting but in the end I thought I had to see what all the fuss was about and ordered the Steak & Kidney. Could it challenge near the top of our best pies in London ranking? Firstly, I was delighted when this pie came out and it was fully encased in pastry. This was the pie experience I had been hoping for. Pierateer RAS and myself had visited The Windmill's sister pub (The Guinea Grill) in 2012 and found the pies were top-crusts. Not a hint of that here though. The pie came served on a long rectangular plate, with nicely presented mash and veg. The pie did not look particularly large or spectacular, but I think the wonderful, crispy, golden pastry hinted at something quite special. It is amazing what a good glaze can do to a pie. Slicing into the pie revealed there were two different aspects to the pastry, the crispy outside cracked to reveal predominately soft gooey pastry inside. The pie was packed with a thick, rich meaty filling which, happily for me, did not taste too strongly of kidney. What delighted me most was the fact that they had used suet crust pastry. I think this gives a wonderful taste to the pastry as well as a rich meaty flavour to the whole product, as with Paul's pies which we so highly regard. In fact this was very similar to Paul's Pies but with softer pastry. How did it rate? I would straight away put this as the best Steak & Kidney pie I have ever had. The meal was small for the £12.50 price but I found it filling. Whilst it might be more expensive than some, for the quality, the location and the overall experience I considered the price was decent value. I am very keen to go back and try some more of The Windmill pies. See the score breakdown below. Overall the score of 6.25 puts this second on our list of best London restaurant pies, quite an achievement given how many places we have reviewed. It also means this pie gains 'Pierate Highly Recommended' status and slots in inside our Top 30 pies as the top Steak & Kidney pie. Condition – 5.50 out of 7 – The presentation of the meal looks gourmet but the pie itself is unassuming in appearance. Colour – 6.95 out of 7 – Am I allowed to give a perfect 7? I just can't imagine a better colour, this is what made me realise the pie would be great. Capacity - 6.50 out of 7 - The domed lid indicated a strong amount of filling. No real air gap to speak of. Chewiness - 6.50 out of 7 - Soft and moist beef, the texture was super. If anything the texture of the pastry was a little too soft and it lacked the structure I would expect from the ultimate pie. Consistency - 6.60 out of 7 - It worked extremely well with the suet pastry complementing the beefy filling. Whilst there wasn't much to criticise this pie for, could another flavour challenge the top of our pie charts? After the meal it was very nice of the manager, Karl, to come over from The Guinea Grill to talk to us. He seemed pretty passionate about pies and creating new flavours. I suspected that the pie flavours written on the chalk board could be subject to change based on his latest creations. 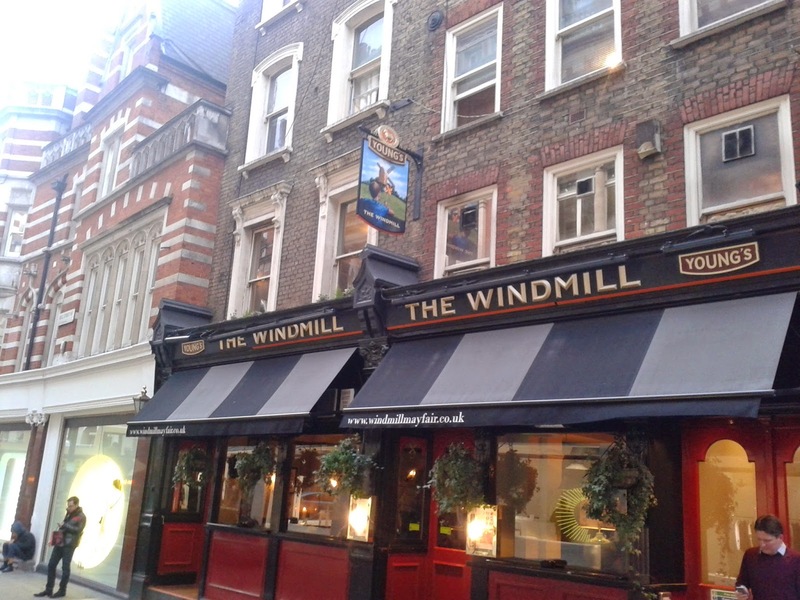 I also learnt that The Windmill use the same pie filling recipes as The Guinea Grill, however, they just choose not to fully encase them at The Guinea (madness!). I did also get to the bottom of the issue about the awards their Steak & Kidney pie had won. Apparently, it was a now defunct Steak & Kidney pie award in London and the three wins were over a decade ago, before the British Pie Awards had even started! It may seem that this is somewhat living on past glories but they have certainly not rested on their laurels. This is still a great pie and with a changing pie menu, I would certainly recommend a visit to The Windmill. Note: We have suggested to Karl to enter the British Pie Awards but he says that because the pies have to be pre-cooked, it wouldn't work with his suet pastry very well. Perhaps it's about time there was a restaurant pie award as part of the BPA or elsewhere? continue reading "Pies for Sail at The Windmill"